The Viaro stroller with one-hand quick fold comes loaded with convenient features you and baby will love. 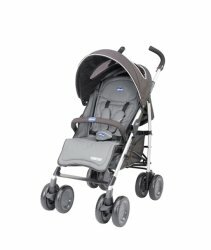 The ultra-lightweight aluminum frame makes the stroller easy to fold, load and carry, .. Description: A simple yet perfect stroller for your little one! Comes with a snugly padded, fully reclining backrest, so your baby can sleep even from his first few days. Features: A roomy ..
Cortina Stroller: Multi-position Memory Recline seat remembers the last position before folded! Convenient one-hand fold Multi-position leg rest and flat recline Toe-tap rear br..
Cortina Stroller: Multi-position Memory Recline seat remembers the last position before folded! Convenient one-hand fold Multi-position leg rest and flat recline Toe-tap r.. The contemporary Chicco LiteWay Stroller is suitable from birth up until 3 years (approximately 15kg). The forward-facing seat unit has four recline positions, one of which is a near-flat positio.. Description: The elliptical aluminum chassis tubes make this a contemporary and stylish stroller. This stroller is suitable from birth. It comes complete with a matching fleece footmuff that c..
Snappy, the neat no-fuss lightweight stroller, ideal when travelling! Sappy is the most basic no-fuss stroller in the Chicco range but no less attractive and practical. Mod..